Mushrooms, Green Cabbages, Red Cabbages, and other produce prices are still high. Strawberries – Local Season is finishing; Imported SA Strawberries are available. Prices of Roma Tomatoes are going up. Season of Local Peaches and Nectarines is finished. Please contact your sales representative for the details. Aust Mandarins, Rambutans, Toffee Apples, New Season Granny Smith Apples, Golden Delicious Apples, Fuji Apples, Royal Gala Apples, Local Grapes, Quinces, Bosc Pears, Red Pears, Nashi Pears, Tomatillos, Mangosteen, Chestnuts and Cumquats (Please contact your sales representative for pre-order). Local Purple (white flesh) Sweet Potatoes, Chokos, Heirloom Squash, Spaghetti Squash, Heirloom Eggplant, Heirloom Tomatoes, Heirloom Pumpkin, Salt Bush, Samphire, Ice Plant (Please contact your sales representative for pre-order). 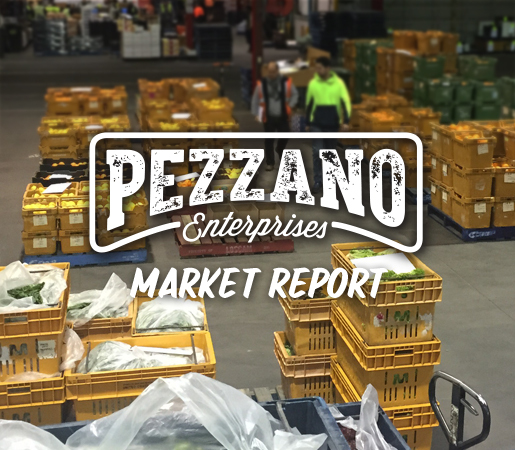 Local Mangoes, Custard Apples, Nectarines, Padron Peppers, Covolo Nero, Butter Beans, Fresh Peas, Strawberries, Green Mangoes, Cherry Truss Tomatoes, Festival Lettuce, Green and Red Cabbages. Peaches, Kiwi Berries, Purple Cauliflower, Apricots, Lychees, Cherries, Cherry Plums, Smoked Garlic, Jerusalem Artichokes, Blackberries, Broad Beans (Frozen Packets are Available), Mulberries, Star Fruit, Kalettes, Purple Brussel Sprouts and Blood Oranges.